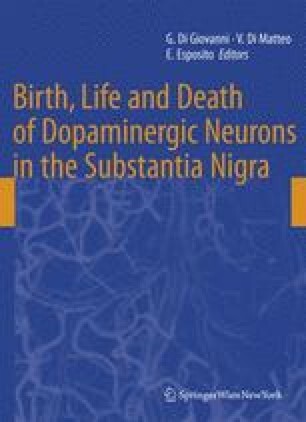 We have observed in previous studies that 6-hydroxydopamine (6-OHDA)-induced lesions in the nigrostriatal dopamine (DA) system promote increases of the astroglial basic fibroblast growth factor (FGF-2, bFGF) synthesis in the ascending DA pathways, event that could be modified by adrenosteroid hormones. Here, we first evaluated the changes of microglial reactivity in relation to the FGF-2-mediated trophic responses in the lesioned nigrostriatal DA system. 6-OHDA was injected into the left side of the rat substantia nigra. The OX42 immunohistochemistry combined with stereology showed the time course of the microglial activation. The OX42 immunoreactivity (IR) was already increased in the pars compacta of the substantia nigra (SNc) and ventral tegmental area (VTA) 2 h after the 6-OHDA injection, peaked on day 7, and remained increased on the 14th day time-interval. In the neostriatum, OX42 immunoreactive (ir) microglial profiles increased at 24 h, peaked at 72 h, was still increased at 7 days but not 14 days after the 6-OHDA injection. Two-colour immunofluorescence analysis of the tyrosine hydroxylase (TH) and OX42 IRs revealed the presence of small patches of TH IR within the activated microglia. A decreased FGF-2 IR was seen in the cytoplasm of DA neurons of the SNc and VTA as soon as 2 h after 6-OHDA injection. The majority of the DA FGF-2 ir cells of these regions had disappeared 72 h after neurotoxin. The astroglial FGF-2 IR increased in the SNc and VTA, which peaked on day 7. Two-colour immunofluorescence and immunoperoxidase analyses of the FGF-2 and OX42 IRs revealed no FGF-2 IR within the reactive or resting microglia. Second, we have evaluated in a series of biochemical experiments whether adrenocortical manipulation can interfere with the nigral lesion and the state of local astroglial reaction, looking at the TH and GFAP levels respectively. Rats were adrenalectomized (ADX) and received a nigral 6-OHDA stereotaxical injection 2 days later and sacrificed up to 3 weeks after the DA lesion. Western blot analysis showed time-dependent decrease and elevation of TH and GFAP levels, respectively, in the lesioned versus contralateral midbrain sides, events potentiated by ADX and worsened by corticosterone replacement. ADX decreased the levels of FGF-2 protein (23 kDa isoform) in the lesioned side of the ventral midbrain compared contralaterally. The results indicate that reactive astroglia, but not reactive microglia, showed an increased FGF-2 IR in the process of DA cell degeneration induced by 6-OHDA. However, interactions between these glial cells may be relevant to the mechanisms which trigger the increased astroglial FGF-2 synthesis and thus may be related to the trophic state of DA neurons and the repair processes following DA lesion. The findings also gave further evidence that adrenocortical hormones may regulate astroglial-mediated trophic mechanisms and wound repair events in the lesioned DA system that may be relevant to the progression of Parkinson´s disease. This work was supported by grants from FAPESP (95/9060-6; 98/13122-5; 99/01319-1; 07/00491-3) and CNPq, Brazil. We thank Dr. Jessica Ruivo Maximino for helping with Western blot of FGF-2.